On an afternoon in mid-December, as my final fall semester at St. Tikhon’s concluded, and as questions and decisions about “what comes next” were weighing on my heart, I picked up the phone and called my bishop, His Eminence, Archbishop JOB. Vladyka was on the road, a familiar place to find him, on his way to another archpastoral visit somewhere among the eleven states in his diocese, which spans from North Dakota to Ohio. My family and I had scheduled to have lunch with Vladyka in Chicago a few days before Christmas, and part of me thought these questions could wait until then. Nevertheless, I made the call. Just over one week later, we received the news that Vladyka had unexpectedly fallen asleep in the Lord. I immediately recalled our conversation, and realized that the pain of loss I was feeling was much greater and deeper than I would have anticipated. Of course, we mourn the loss of our hierarchs, we love them and we honor them with special services, as ones who were given a great task, a great burden of prayer and discernment for so many souls in their care. With Vladyka JOB’s repose, so many of us truly lost a father. As the phone began ringing and emails were exchanged on that afternoon in late December, some of the first people I wanted to talk to, and mourn with, were my fellow Midwest seminarians. All of us shared memories of Vladyka’s care, guidance, and support throughout our seminary experience. From the first spark of vocation, Vladyka showed personal interest in each of us, and our families. I recall vividly His Eminence specifically recommending I go to St. Tikhon’s. It was good for me. Vladyka reminded me on many occasions that this experience was going to go by very quickly, and before I knew it I would be serving a parish community. As the years at seminary passed, the occasional conversations with Vladyka, while often brief, came to be greatly treasured. There was always a word I needed to hear. Some of my fondest memories were of Vladyka’s visits to St. Tikhon’s, which occurred every semester. He treated all of his seminarians, their families, and pretty much whomever else wanted to come along, to dinner, conversation, and usually some great stories from his years at seminary; the infamous “duck story” being among the most legendary. His sense of humor, together with his real interest in and dedication to his seminarians and their families, forged a strong bond. That bond made it not only possible, but even normal for a seminarian like myself to feel completely comfortable picking up the phone and calling him, not only with questions of procedure, but for real spiritual direction and counsel. We all knew that decisions made about our future, whether that be ordination or placement, were made with prayer and careful spiritual discernment. An archpriest recently summed up Vladyka’s legacy by saying simply, “He was a pastor of pastors.” In addition to the support and direction those of us in his diocese received during seminary, we also were given a great example of how to be a pastor. He exuded an ethos of genuine care and Christian love that invited emulation; a model of leadership that exemplified self-sacrifice and humility. I know that I learned many lessons from him, many of which I didn’t realize until much later, and many that I’m sure will continue to reveal themselves as my journey as a pastor continues. His Eminence often made the trip to St. Tikhon’s for the Memorial Day Pilgrimage. 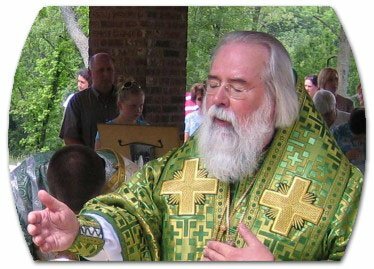 He loved St. Tikhon’s, and his absence this year will certainly be felt. In one of the last conversations I had with him, he was extremely pleased to hear that the accreditation process at the Seminary had gone well, and he was excited to see the growth and recent developments at the Monastery. Those of us who have been shepherded by him in our years at seminary will no doubt miss his presence at the Pilgrimage. We will miss the opportunity to speak with him, to have him inform us of the exact number of years, months and days until his retirement, which he was fond of doing. But there is a joyful sadness, knowing that this tireless servant of Christ has received rest, as we continue to pray for his blessed repose among the Saints. And we can be joyful that we were blessed with his guidance, care, and example through our years of formation. May Vladyka’s Memory be eternal! Posted in Life Matters, Uncategorized.